Fall is one of the best blooming seasons for roses. As the weather cools, the plants get back in “flower machine” mode. Make sure you get the most bang for your buck in a few weeks, by giving them a little extra care now. Remove faded flowers, cutting back to at least the first leaf with five leaflets. Roses, such as floribundas and shrubs, which bloom in clusters, can be lightly sheared after blooms fade. Water regularly; at least once a week in most areas but more frequently in the hottest climates. Make sure you water deeply so the water penetrates 12 to 18 inches (you can check water penetration by probing the soil with a stiff wire or screwdriver. The probe should move easily through moist soil and be harder to push in dry soil). Replenish mulches to conserve water and reduce weeds. 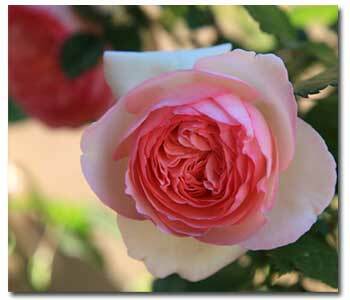 Fertilizing and protecting roses from late season insects and diseases is also very important. You can easily feed and protect with Bayer Advanced™ All-In-One Rose & Flower Care Concentrate. No spraying is necessary. Just mix with water and pour around the plant base. One application fertilizes your roses to encourage fall bloom and protects plants from insects and diseases (including powdery mildew, black spot and rust) for up to 6 weeks. To protect against spider mites (and other insect pests), and cure and prevent disease, use Bayer Advanced™ 3-in-1 Insect, Disease & Mite Control Ready-To-Use. Always read and follow label instructions. While you’re preparing your roses for a great late-season bloom, considering sprucing up you’re flower beds by planting complimentary fall-blooming plants. Ideal companion plants for roses include fall-blooming perennials, such as asters, mums, ornamental grasses, penstemons, salvias and cool-season annuals like pansies, violas and alyssum. Foliage plants, such as lamb’s ears, artemisias, and dusty miller, as well as variegated sages and thymes, combine spectacularly with roses.